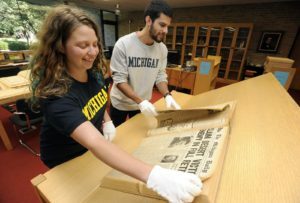 The Bentley Historical Library can be an exceptional resource for faculty teaching classes at the University of Michigan. Students learn critical thinking, historical empathy, and more during engaging, hands-on sessions with archival materials! Develop class sessions using Bentley’s rich collections. Design course-specific active-learning sessions to strengthen critical thinking skills using carefully curated selections of materials that can deepen students’ understandings of a subject, period, or document format. Guide students in how to search and discover materials within our holdings, using various databases and search strategies. 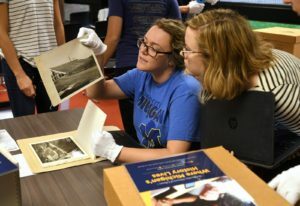 Arrange an archivist’s presentation in your classroom (without original documents) on topics related to our collections, especially University of Michigan history. Contact Archivist for Academic Programs and Outreach, Cinda Nofziger at cindamn@umich.edu. We ask that you contact us a month in advance, if possible. Please have your class review our reading room rules. Remind students that the Bentley is not their usual classroom setting – consider sharing our statement developed with Services for Students with Disabilities office: This class will visit the Bentley Historical Library during the semester. You will have an opportunity to work with original materials, such as handwritten diaries, photographs, typewritten correspondence, audio-visual material and other types of primary documents. If you think you might need a special accommodation to access this material, please let your instructor know, or contact the Bentley’s Archivist for Academic Programs and Outreach, Cinda Nofziger (cindamn@umich.edu). For directions, bus and parking information, please see our visiting the Bentley page. Over two visits, 25-30 students learn about the Bentley, and in small groups, examine original materials created by the Detroit Urban League, which helps them critically analyze secondary sources about Detroit’s urban history. On their second visit, one of the Bentley’s field archivists joins the class for a conversation about our current collecting efforts in Detroit. Up to 75 students visit the Bentley to examine local high school yearbooks from the 1910s through the 1950s.. Using a group activity, followed by guided discussion, the students identify how yearbooks reflect changes in schools over time, particularly in terms of demographics and educational priorities. After a brief introduction to the Bentley, students spend 1.5 hours examining letters from early University of Michigan students, from Michigan settlers, and from Michigan residents who served in the Civil War or World War II. Students choose a letter to respond to for their class assignment. 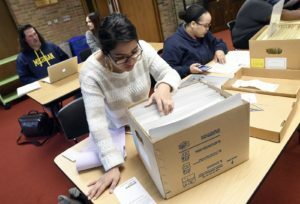 Upper-level undergraduates participate in a semester-long research project using materials related to the University of Michigan’s first environmental teach-in, statewide grassroots environmental activist organizations, and the creation of protected areas in Michigan. The project culminates in a website featuring over 800 digitized primary source documents. Students visit the Bentley three times as a class, and return to the reading room in small groups for many hours of independent research.